The New York Giants will play at home against the San Diego Chargers and the New York Jets have a bye week. The Giants have lost 3 in a row and have looked terrible especially defensively. Eli Manning has looked bad and you have to wonder about his foot although he say's he is fine. They really need a win this week. I am going to say they are going to win this game because San Diego doesn't travel well and although they are talented they are a flawed team. I am going with Giants 24- Chargers 17. I think the Giants will go back to what they do best running the ball and playing good hard defense. I think the defense will be helped by getting Aaron Ross, Chris Canty and Michael Boley back and will really be upset and flying around the field. The Jets are off this week so nothing to go over there. I have to find another game and I am going to go with Dallas defeating Philadelphia, I don't think Philly is as good as they looked against the Giants and the Cowboys are playing really well. I am going to say Dallas 30- Philly 21. I did not get to attend the parade but I did watch it on T.V. and it was fantastic. The New York Yankees are champions once again and that can never be taken away. It was great hearing Joe Girardi say that he is changing his number to 28 now and that the boss told him there is only one thing better then this and that is doing it again next year. It was great seeing the first timers like A-rod, CC, Tex, Swish,Cano, Melky, Joba,Hughes and all the rookies. There had to be easily a million and maybe 2 million at the parade. I always say this too, NY gets a bad rap but when it comes to things like this they bond together and there really is never any issues like there are in other cities. It is going to be a great offseason but reality is going to set in soon that there is no more baseball to look forward to and it will be a cold winter but at least happy. Joe Girardi reminded us that there is only 96 now 95 days until pitchers and catchers so that is something to warm the heart. I will enjoy the holidays and won't be posting as much but will try to keep up with any hotstove stuff and now I have to start getting into the other sports as well so keep coming back to visit and maybe I will have some live chat or chats about the hotstove. The Boss George Steinbrenner issued a statement earlier today on the Yankees winning the World Series and here it is: "The Steinbrenner Family and the Yankees Organization are extremely proud of the members of the 2009 New York Yankees for bringing a 27th World Championship to New York City and our fans, the greatest fans in the world. Every World Series victory is special, but this one is especially sweet coming in the first year in our new home. "The 2009 New York Yankees proved that we are the best in baseball. We beat truly worthy opponents in the American League Division Series, the American League Championship Series and the World Series. As we did all season long, we fought hard, never lost focus and gave a true team victory. Our players have a lot to be proud of. This group will become legendary - similar to the 26 World Championship teams that preceded them. "Joe Girardi and his team deserve great credit for racking up wins over a long, tough season. "We are so grateful to our fans. They have never wavered in their faith or enthusiasm through the good and bad years. This World Series belongs to them and to all Yankees, past, present and future. "We'll enjoy this win. And the quest for No. 28 begins." It is amazing to think back at all the things and that this team was actually 13-15 without A-rod. The Yankees had assembled a great team, you just never know how it is going to fit together but guys like Swisher and A.J. and CC just came tco this team and changed the culture, made it more fun and fit right in. CC Sabathia was everything the Yankees hoped for and more, he pitched great but turned out to be a great teammate and person also. It all started in spring training when he purchased tickets to the Orlando Magic games and would take different teammates out to the games. He also in April got tickets to the Cavs playoff game when the Yankees were out in Cleveland and basically the whole team attended, it may not seem like much but it really helped this team grow together and enjoy being with each other so they really fought for each other and stuck with it through thick and thin. Joe Girardi in spring training knew he needed to change his ways a little from last year and organized a team pool tournament instead of practice the one day and that really is where it all started. The team just seemed to mesh together and really enjoy playing for Joe Girardi and each other. It wasn't always easy, they were 0-8 to the REd Sox in the beginning and they were 13-15 until A-rod came back on May 8th. His first swing he hit a homerun and that seemed to just set the tone. I think one of the biggest hits though was Francisco Cervelli hitting a homerun in Atlanta as the team was really struggling to score runs and stay afloat, that is when Brian Cashman made a suprise visit and they took off after that. There still was another bump in the road when they got swept in Anaheim 3 straight right before the all-star break. This team never game up though and knew they needed to beat the Angels and Red Sox in the second half and they did that as well as beat everyone else. They really made the New Stadium a real home as they only lost 8 games there the second half of the season and only lost one home game in the playoffs. This Yankee team now has to be compared with some of the best there ever has been, they remind me of the 98 team. They finished 114-63 which in their division and league is just incredible. I don't know what next year will bring but they sure have a nucleus to stay on top for a long time. CC, A.J. Joba, Hughes, Robertson, Tex, Swisher, Cervelli, Pena, Cano, Cabrera, Gardner. These are all young guys that are making their mark now and for the future. The Yankees are Champions of baseball and back on top of the world where they belong. 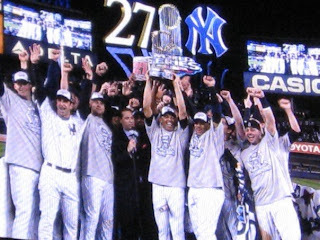 The New York Yankees are once again World Series Champions defeating the Phillies 7-3 last night in Game 6. Hideki Matsui got the well deserved MVP especially after tying the World Series record for most rbi's in a single game with 6, Bobby Richardson was the other one to do it. Andy Pettitte continued to add to his most wins in postseason history with 18 and now has also closed out 6 series in his career also a record. Andy Pettitte also became only the second pitcher to close out all 3 series in the postseason, the other one was Derek Lowe for the Red Sox in 2004 which we try to forget about. Order is now restored to the Universe with the Yankees becoming the 27 time World Champions and making it 2 titles this decade which ties the Boston REd Sox, I hope you beaneaters were watching last night. Derek Jeter had a great World Series, what else is new and A-rod had a lot of huge hits and had the highest avg on the team for the postseason. I will have a lot more later as I am punchdrunk from being at the game last night and I have no idea how I am functioning today. Here are some pictures from the celebration above and now the Parade is tomorrow at 11. The New York Yankees take on the Philadelphia Phillies tonight at 7:57 on FOX. They are looking to close out their 27th title tonight with Andy Pettitte on the mound against Pedro Martinez. Andy is on 3 days rest for the first time in a couple of years and first time in a long time in the postseason. Pedro is on normal rest but has been on extended rest his first 2 playoff games. Here are the pregame notes and lineups via the Lohud Yankees Blog. I will be at the game tonight so I may not have postgame coverage at all and the notes here may be shorter then normal. This is only the second time in WS history that a team led 3-2 in the World Series after losing Game 1 at home, winning Game 2 and then winning Games 3 and 4 on the road and losing Game 5 on the road. The other team was the 1935 Tigers who ended up winning Game 6 at home against the Cubs. If the Yankees win this World Series would they be the team of the decade?? They would have won 2 titles, been to the World Series 2 other times, lost in the ALCS once. The Red Sox would be the closest competitor with 2 titles losing in the ALCS twice but they missed the playoffs 4 times to the Yankees 1 time last year. Chase Utley has 5 homeruns this series and 4 against lefties, I think they need to brush him back tonight or pitch around him. A-rod has 18 rbi's in the playoffs which is 4th most all-time, the record is 19 held by Sandy Alomar Jr. David Ortiz and Scott Spezio. Johnny Damon has been hot going 6 for his last 9, A-rod is heated up and Matsui has been hitting when he has played going 5 for 9. Yankees Lineup: Jeter(SS) Damon(LF) Tex(1B) A-rod(3B) Matsui(DH) Posada(C) Cano(2B) Swisher(RF) Gardner(CF) No Phillies lineup yet but expect the same unless Victorino can't go. The New York Yankees worked out at Yankee Stadium today. The Philadelphia Phillies took the day off. Shane Victorino is being listed as day to day although he is saying he will play tomorrow. Pedro Martinez is getting the start for the Phillies and was his ever entertaining self today in the press conference. He said usually people say good things about you when you die but they should say them about him now, he doesn't want to wait until he dies. He also said he will try his best as always but who knows how he will do tomorrow. You can hear his press conference on http://mlb.com. Andy Pettitte will get the ball on 3 days rest tomorrow for the Yankees, he hasn't pitched on short rest in 2 years and for his last 8 starts has been on long rest. The one thing you know about Andy Pettitte is he has guts and will give it his all, you will probably know early if he has it or not. If his control isn't good and he struggles early I wouldn't be shocked to see Chad Gaudin in the game, I do think the Yankees will hit Pedro this time around though. I know a lot of people are complaining about using A.J. Burnett on short rest in Game 5 instead of Gaudin but I just couldn't see giving away any game in the postseason and to me that is what you would of been doing. I know Andy is on short rest now but I still trust him to give 5 or 6 decent innings and the bats to do their job and you have the best weapon at the end of the game in MO, I can see him going 2+ innings tomorrow if need be. The Phillies don't have any idea of who to go to in the late innings as the Yankees have done damage to all of their big relievers. It should be an interesting night tomorrow. Joe Girardi did say in his press conference that he isn't sure who will start in RF. I would of though Nick Swisher since he has woke up a little from his slump but Jerry Hairston Jr. did play Game 2 against Pedro since he has hit him in the past and Eric Hinske is 8 for 30 in his career against Pedro. A.J. Burnett only threw 53 pitches so I am wondering if he will be in the pen tomorrow at all or only for a Game 7 and how he would or could be used?? This is another fascinating aspect of theese games. The Phillies have Cliff Lee available for a similar role since he will not start anymore games. The New York Yankees were defeated by the Philadelphia Phillies last night by the score of 8-6. A.J. Burnett got the start on 3 days rest and was dreadful. He lasted 2 1/3 innings giving up 6 runs. He had no location or control at all and just couldn't get anything going. The Yankees got off to a fast start against Cliff Lee with a rbi single by A-rod in the first but couldn't score anymore. Cliff Lee wasn't so great himself but was able to give the Phillies 7 innings giving up 5 hits with 5 runs, 3 walks and 3 strikeouts. Chan Ho Park pitched a perfect 8th inning and then things got interesting in the ninth. Brad Lidge who got lit up the night before did not come in to save the game Ryan Madson came in as the closer and gave up a leadoff double to Jorge Posada followed by a single to Hideki Matsui. The Yankees had first and third no outs and were poised for the comeback with the top of the order coming up. Derek Jeter hit into a double play killing the rally though even though a run scored. Johnny Damon kept the game alive with a single and then Mark Teixeira who hasn't done anything offensively in this series popped out to end the game leaving A-rod stranded in the on deck circle. The Yankees had their chances even though A.J. Burnett got lit up and they were way behind. The real dagger came when it was 6-2 thanks to good relief pitching by Dave Robertson and Alfredo Aceves who pitched 4 innings giving up 0 runs on 2 hits. Phil Coke pitched the seventh and gave up 2 solo homeruns to put the game seemingly out of reach. The Yankees did comeback and those 2 runs turned out to be the game winners. Phil Hughes pitched 1 1/3 scoreless innings giving up 1 hit. If it wasn't for Phil Coke's terrible outing who knows what would of happened. The Yankees though are back home in the bronx to try and close it out where there fans will be loud and crazy and Andy Pettitte will be on the mound. He is pitching on 3 days rest which is dangerous but if he can keep them in the game and give them 6 innings the Yankees will take it. The Yankees have a rested Mariano Rivera and Joba Chamberlain along with Damaso Marte to close out the game. I am sure Mariano will be used for 6 outs if need be but we will see what happens. I know Pedro pitched well in Game 2 but I don't think that will be happening again. The Yankees offense has woken up after the first 2 games and scored some runs so I look for them to jump on Pedro and knock him out early and also get to their pen, if Andy doesn't blow up the Yankees could run away with this one but that depends on Andy Pettitte. The Yankees will play tonight at 7:57 on Fox, they are one win away from their 27th title. The Yankees have held a 3-1 lead in the World Series eight previous times and they’ve won the title each time (six times in Game 5, two times in Game 6). I think tonight is going to be a tough task with Cliff Lee on the mound against them but A.J. Burnett pitched brilliant in game 2 and has done very well in the past on 3 days rest. Here are the pregame notes and lineups via Sam Borden of the Journal News. The Yankees have used only three starters throughout the postseason and they are the first team to reach the World Series with a three-man rotation since the 1992 Braves (Maddux, Glavine, Avery). The last team to win the World Series with three starters came a year before that, when the 1991 Twins (Morris, Tapani, Erickson) beat Atlanta. The 15 runs scored by the Yankees in Games 3 and 4 marks their biggest World Series outburst since they scored 18 runs over Games 1 and 2 of the 1998 World Series against San Diego. The Yankees haven't been hitting but I think it is a combination of who is pitching for the Phillies and th small ballpark in Philly. Mariano Rivera made his 11th appearance of the postseason in Game 4, matching his career high (also 2001). The only games in which he hasn’t pitched are Game 4 of the ALCS and Game 1 of the World Series. Rivera has thrown more than one inning five out of 11 times and more than two innings three times, recording a 0.63 ERA in 14 1/3 innings while striking out 13. I wonder with a lead if the Yankees will go to MO in the 8th tonight with a chance to wrap things up, i am guessing yes but we will see. The middle of the Yankees order hasn’t been a consistent producer during the World Series with Mark Teixeira and Alex Rodriguez combining to go 3-for-28 with 13 strikeouts. Rodriguez’s two hits, at least, have been meaningful – he homered in Game 3 and drove in the decisive run in Game 4. It looks like A-rod has awoken maybe by getting hit all these times they woke a sleeping giant. When Johnny Damon stole second and third base in the ninth inning of Game 4, he became the 13th player to record two stolen bases in an inning in the World Series. The last was Tampa Bay’s B.J. Upton in Game 3 last year. That was such a heads up play by Damon but I think he gave a lot of people heart failure. The Yankees have been hit by five pitches in the World Series, one shy of the World Series record. Pittsburgh was hit by six in 1909 and Arizona was hit by six (from Yankees pitchers) in 2001, both of which were seven-game series. Yankees Lineup: Jeter(SS) Damon(LF) Tex(1B) A-rod(3B) Swisher(RF) Cano(2B) Gardner(CF) Molina(C) Burnett(P) Phillies Lineup: Rollins(SS) Victorino(CF) Utley(2B) Howard(1B) Werth(RF) Ibanez(LF) Feliz(3B) Ruiz(C) Lee(P) Ramiro Pena is replacing Melky Cabrera on the roster as he is out with a hamstring injury. The Yankees are able to replace him on the roster with approval by MLB if they feel he won't play anymore games this season. He injured himself late in last nights game running to first base. The New York Yankees defeated the Philadelphia Phillies tonight by the score of 7-4. They won this game in dramatic fashion. Joba Chamberlain came on to pitch the 8th inning with the Yankees leading 4-3. He struck out the first two hitters making it look easy and then boom a homerun from Feliz and the game was tied. Joba got the last out by strikeout also. Brad Lidge came in for the 9th and got Matsui and Jeter easily so there was 2 outs and no one on when Johnny Damon put together a great at bat finishing it with a single. He then stole second and kept running to third when he saw no one covering. Mark Teixeira was up next and got plunked and then A-rod came up to the plate and smacked a rbi single and then Posada hit a 2 run single. Mariano came in to finish off the game on 9 pitches. I don't know what they will do tomorrow but if I have a lead in the 8th inning of 1 or 2 runs I would go to MO to finish this thing off. Derek Jeter had a big game for the offense with 2 hits and a walk and rbi. Johnny Damon had 3 hits and a rbi. Jorge Posada had a hit and 3 rbi's and Melky Cabrera and Robinson Cano each had a hit. Mark Teixeira continues to struggle with only one hit in this World Series but the Yankees are one win away from their 27th World Championship anyway and he had a great year and is still making all the plays in the field. A.J. Burnett will be on the mound against Cliff Lee to try and finish this World Series off. I think it is going to be a very tough game tomorrow as all of them have been but even more so since the Phillies are facing elimination at home with their ace on the mound. Cliff Lee was dominant in Game 1 but I am not sure he can be that good again as that was a historic performance. The Yankees want to finish it but know that if they don't they will be going home to try and finish it off. I will be going to Game 6 if there is one but I don't want to go, I would love to see the Yankees win tomorrow and let the partying begin. The Yankees are a veteran team and I don't think they will think ahead but it has to be hard not to think how close to their goal they are. The Yankees have really hit the last 2 games here in Philly and must have a lot of confidence going into tomorrow. I am sure this is the biggest game of Cliff Lee's life tomorrow and it will be interesting to see how he responds. The Yankees will try to make it 3 straight over the Phillies and move within one game of their 27th World Title. CC Sabathia the Yankees horse will be on the mound against Joe Blanton who the Yankees have done really well against when they have faced him. He faced them 4 times and has a 8+era from when he was in Oakland. Here are the pregame notes and lineup via the Lohud Yankees Blog. Sabathia will be pitching on short rest for the second time this postseason though he had extra rest (seven days) before his Game 1 start. Going short isn’t a problem for Sabathia, who is 5-3 with a 3.16 ERA when pitching on short rest in his career (including postseason). The last time he did it, he went eight innings allowing just one run in Game 6 of the ALCS against the Angels. I actually think CC was a little off in Game 1 although he pitched well and expect him to be better tonight. Alex Rodriguez finally got his first World Series hit in Game 3, hitting a two-run home run in the fourth inning also making history as the first postseason use of instant replay. Rodriguez was also hit by pitches twice, tying a World Series record set on five other occasions. If A-rod hits now in the World Series watch out, the Yankees are a different team when he is hitting. While A-Rod broke out of his mini-slump from the first two games, Phillies first baseman Ryan Howard continues to be a non-factor. Howard fanned seven times in his eight at bats in Games 2 and 3, and his nine total strikeouts are three shy of the overall Series record (set by Kansas City’s Willie Wilson in 6 games in 1980). The Yankees would like Ryan Howard to wait until next year to break out of his slump. After struggling in his first postseason appearance during Game 3 of the Division Series, Damaso Marte has been the most reliable reliever in the Yankees bullpen ever since. He has faced nine batters and retired them all, striking out three. Marte has thrown 77 % of his pitches for strikes. Marte is finally resembling the guy the Yanks thought they traded for. Jorge Posada’s single in the seventh inning of Game 3 was his 87th postseason hit, moving him past Pete Rose and into seventh place on the all-time list. Those who were worried about Hideki Matsui coming off the bench needn’t have fretted: Matsui now has a .370 (10-for-27) career pinch hit average, including the regular and post-season. He alsoconnected for the 24th pinch-hit home run in World Series history in the eighth inning of Game 3, and that was the first since his teammate, Eric Hinske, did it for the Rays in Game 4 of last year’s Series. Of the 24, it was the eighth by a Yankee (last was Jason Giambi on Oct. 23, 2003, Game 5 at Florida). Yankees Lineup: Jeter(SS) Damon(LF) Tex(1B) A-rod(3B) Posada(C) Cano(2B) Swisher(RF) Cabrera(CF) Sabathia(P) Phillies Lineup: Rollins(SS) Victorino(CF) Utley(2B) Howard(1B) Werth(RF) Ibanez(LF) Feliz(3B) Ruiz(C) Blanton(P) Joe Girardi announced to the beat writers just a little while ago that A.J. Burnett will be starting tomorrow on 3 days rest and he plans on keeping the 3 man rotation. Chad Gaudin has been told to prepare for anything but unless a starter gets knocked out early I don't think he will get into a game. The New York Yankees defeated the Philadelphia Phillies tonight by the score of 8-5. They are now halfway to World Championship #27. Andy Pettitte got the start and after a rough beginning especially in the second inning when he gave up 3 runs he settled in nicely to pitch 6 innings giving up 4 runs. He had 7 strikeouts as well. The bullpen was outstanding tonight as Joba pitched a perfect seventh and Marte a perfect 8th. Phil Hughes got an out and then gave up a solo homerun before MO came in and got the last 2 outs easily to give the Yankees the win. A-rod broke out of his slump getting hit twice, walking and hitting a 2 run homerun. Nick Swisher had a big game with a double and solo homerun. Johnny Damon had a 2 run double and Andy Pettitte had a rbi single. Jorge Posada also had a rbi single. The Yankees will now send CC Sabathia to the mound in Game 4 tomorrow night on 3 days rest against Joe Blanton. The games aren't played on paper but the Yankees have a big advantage tomorrow and want to take advantage. Joe Blanton is 0-4 with a 8 era against the Yankees in his career and they should be able to hit him especially after the offense woke up tonight. If the Yankees win tomorrow then they will face Cliff Lee in Game 5 trying to finish it off but if not they know they will be coming home with a chance to win the title.